Question 7: How would you like to improve yourself and your life next year? Our Answer: Don’t wait, start by signing up for 10Q today! If you’ve answered this question in the past, then you are likely familiar with 10Q – Reboot’s annual project for personal introspection. 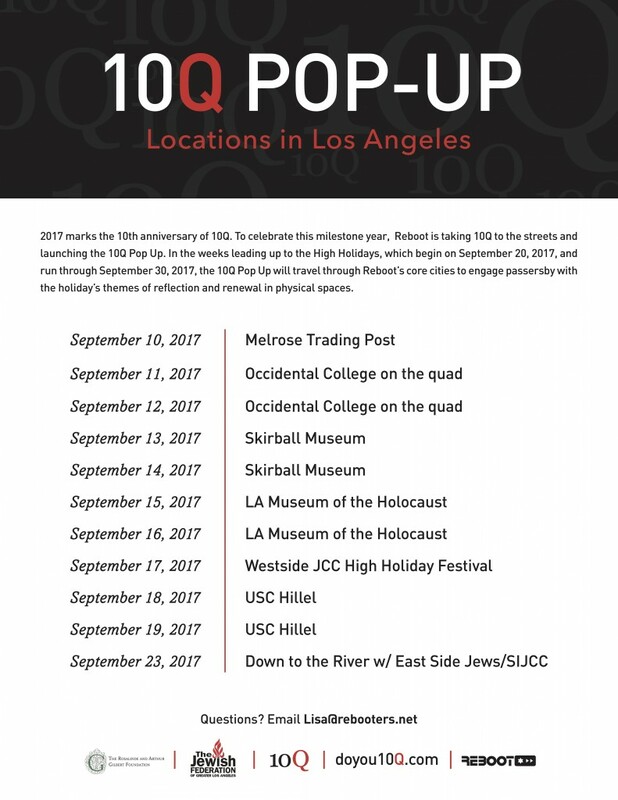 Inspired by the focus on reflection during the Jewish High Holidays, 10Q has presents individuals and communities the chance to look back on their year(s) and chart a new path forward. This year, we are continuing to bring meaningful reflection to thousands around the world and we’ve enhanced many facets of the project thanks to the generous support of the Righteous Persons Foundation. New to 10Q? Here’s the scoop: Start by signing up for 10Q here. Between Rosh Hashanah and Yom Kippur, 10Q emails you a question a day; you send your answers to the secure online 10Q vault, and they are returned to you one year later, as the process begins anew. The aim is to enable a multigenerational and diverse audience to connect with the idea and practice of introspection, fusing modern technologies with ancient practice. Hosting a program in your community or want to facilitate a meaningful conversation at your holiday dinner? We’ve rolled out new tools to engage communities with the launch of our 10Q reflection journals. These pieces offer a taste of the 10Q reflection process in a beautiful presentation and are available in two editions: one for adults and another geared towards families. We are also sharing the Renew Postcard project again, with prompts that allow people to set intentions and goals for the year ahead. Partners around the country are preparing to host over 260 events, with more signing up each day. Sign up to get these tools along with all of our digital resources online here. You’ve asked and we’re launching the re-designed 10Q mobile site just in time for this year’s questions to arrive in your inbox. 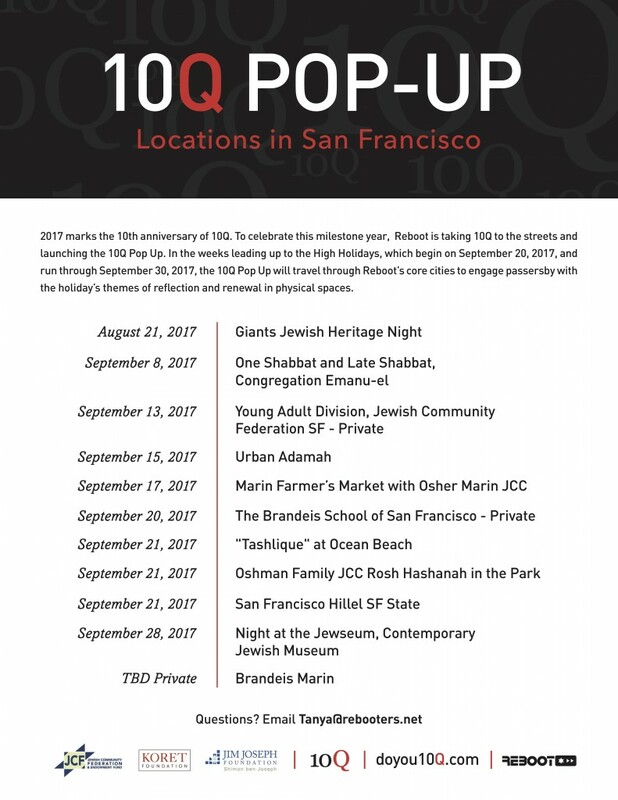 For the first time, 10Q will be mobile-optimized so you can take 10Q with you anywhere you are – so feel free to leave your laptop at home when you go to visit your bubbie for Rosh Hashanah. So, if you are one of the 50,000 people who has answered 10Q questions or an organization hoping to add a meaningful framing for reflection to your holiday programs – we hope you will join us for 10Q this year. Find out more at doyou10Q.com. While working with community partners, we’ll also be bringing our 10Q Pop-up interactive experience to NYC, LA and San Francisco. Check out the graphic below to learn about the 10Q Pop-up experience and find a location near you! We’ll be at these locations all day. It’s a bit of spiritual enlightenment for the High Holy Days with an evening of yoga, sound baths, meditation and other self-care activities. September 16, 7:30pm. Cycle into the weekend at Bespoke Cycling Studio in Downtown LA. We’ll be there. Save your spot! Open Temple has a whole range of High Holiday activities. 10Q will be there offering self-reflection workshops and activities. Discover the events here. Illustrator and Author Lisa Brown’s beautiful, funny, endearing and inspiring works include Picture the Dead, How To Be, The Latke Who Couldn’t Stop Screaming, Baby, Mix Me a Drink and more. Working at times with her husband, Daniel Handler, aka Lemony Snicket – the team is a storytelling power couple. We love it. 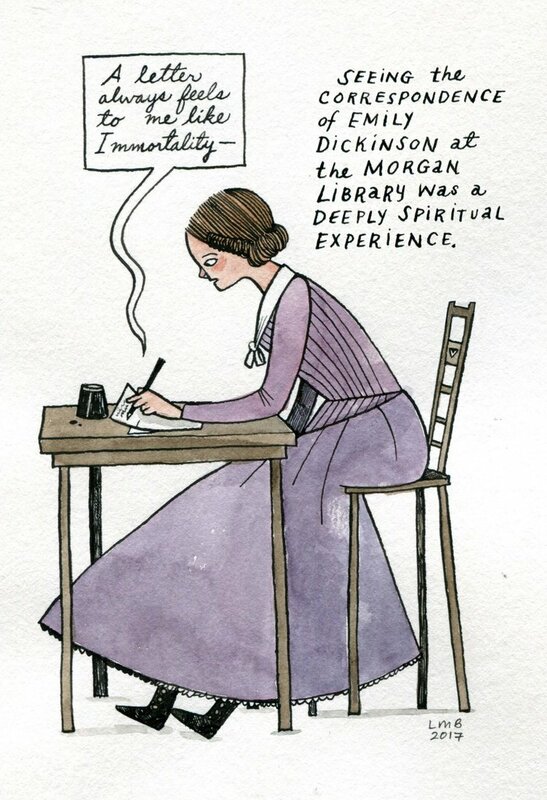 Grateful for her interpretation of 10Q, we’re eager to see your own. Discover Lisa Brown’s works here and check out American Chickens! The Day of Atonement, the holiest day of the Jewish year, begins at sundown Tuesday. For some people, avoiding work and technology as prescribed is simply impractical, but they embrace the spirit of the day in other ways. Yom Kippur is a very personal celebration for many Jewish people, and some young Jewish adults have adopted their own ways of observing the Day of Atonement. This year the holiday will be celebrated from sunset Tuesday through Wednesday night. It is the holiest day of the Jewish year, marked on the 10th day of the Jewish month Tishrei. Traditionally, Yom Kippur is observed by refraining from work, participating in a 25-hour fast and attending multiple synagogue services. Through fasting and prayer, Jewish people repent their sins of the past year. Tanya Fink, 25, is a resident of Seattle’s Moishe house, which hosts events for young Jewish professionals. She identifies as Reform Jewish and describes her faith as a different form of traditional Orthodox Judaism. Fink reflects on her mistakes and relationships over the past year. She also thinks about social-justice issues and how she can do her part to encourage change in the coming year. 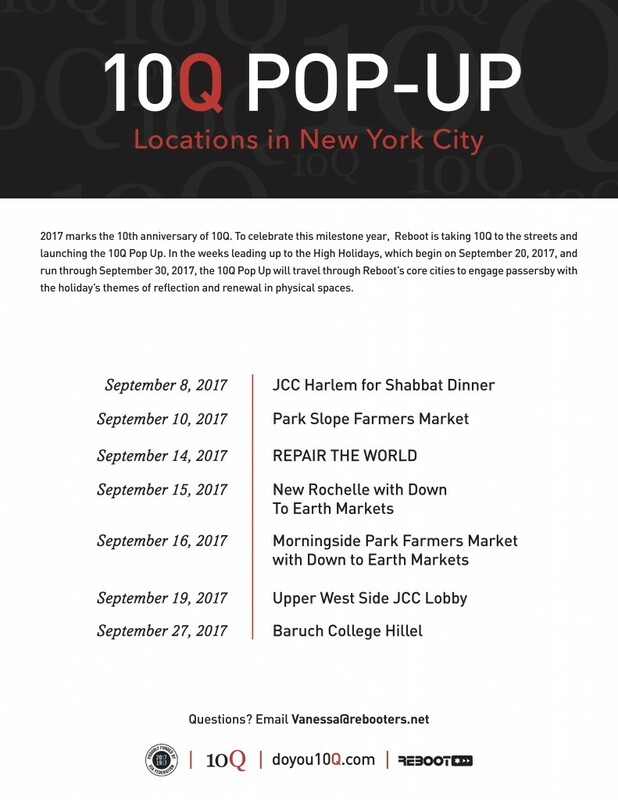 In the 10 days leading up to Yom Kippur, Fink subscribes to a website called “Do You 10Q” that sends her a question to reflect upon each day. A big part of her reflection during Yom Kippur stems from the website’s questions: How would you like to improve yourself and your life next year? Describe an event in the world that has impacted you this year. What is a fear that you have and how has it limited you? Fink also participates in Tashlich, which means to “cast off” in Hebrew. She does this anytime between Rosh Hashana and Yom Kippur. Those who do this toss bread, like Fink did last year in Lake Washington, or bird seed into a body of water to physically represent casting off regrets. She also fasts and tries to wear white, which is a traditional custom. “The fast is definitely meaningful to me. It makes you feel like you’re a part of something bigger than yourself and connects you with all Jewish people around the world,” Fink said. For busy college students, it can be difficult to take off the entire day. Lee Segal, 20, is a junior at the University of Washington and identifies as Reform Jewish. She participates in the fast and goes to synagogue services for the beginning and end of the holiday. “Technically, you’re not supposed to use technology or drive, you’re only supposed to sit and think all day, but as a student I can’t do that,” Segal said. Every year, she reflects by writing down three things she is most sorry for and how she can change them. This is her way of asking for forgiveness and improving in the new year. Bet Alef Meditative Synagogue in Seattle offers daily reflection exercises on its website and encourages young Jewish people to think about what is important this time of year. “I think that younger people and younger generations are looking for a refreshed meaning in the holidays and not (just) celebrating them because that’s what’s always been done,” said Rachel Sofferin, interim executive director at Bet Alef Meditative Synagogue. Sofferin encourages mindful eating and journaling as a good place to begin to find meaning in the holiday. There is a strong community focus on Yom Kippur. Young adults with busy schedules are encouraged to spend time with their community and pray or reflect together. With a number of services offered throughout the day, everyone is encouraged to attend synagogue when they can. Not all young Jewish adults stray from tradition. Nathan Wasserman, 24, also lives in Seattle’s Moishe House and identifies as modern Orthodox Jewish. Wasserman describes his celebration of the holiday as very traditional, which is how he grew up celebrating. He fasts and attends synagogue services throughout the day. He also sticks to tradition by taking the day off from work, refraining from wearing leather, washing and using lotions or perfumes as not to show wealth. Read the original article at The Seattle Times here. That was the gist of a provocative column by Jay Michaelson published earlier this month in The Forward. Michaelson, who writes on religion and progressive politics and is the author of a half dozen books, including Everything is God, wasn’t talking about whether Rosh Hashana should or should not be observed but rather how it is practiced, particularly in the large non-Orthodox synagogues of America where The Forward’s main readership is. The solemn responsive readings and monotone formality, contrasted with the fashion-show frivolity in the pews, make Rosh Hashana just about the worst interface for Jews who only visit a synagogue one or two days a year, Michaelson says. While Michaelson was writing specifically about Jewish life in the US, his message applies to Israel too, where the synagogues are similarly packed on Rosh Hashana with less than regular, shofar-seeking worshipers. Michaelson’s column, not unexpectedly, elicited major pushback with commenters resorting to some ferocious name-calling. But the thing is: he’s not wrong – if you’re willing to think outside the four walls of the shul box. Rosh Hashana has some great messages, to be sure. Celebrating symbolic renewal on this “birthday of the world” – on both the national and personal levels – gives us a prescribed framework for expressing gratitude for what we have and a safe space to acknowledge the beauty and blessing that exists if we are willing to push past the cynical. Seeking forgiveness from our family, friends and neighbors and – more importantly – from ourselves for not living up to the unreachable expectations we so often set, is an important step toward living a more mindful life. There is great communal value in looking back at the year and tallying up our accomplishments (and shortcomings) as if our lives depended on it. It’s just that we’re doing it in the wrong location. The synagogue is no place for Rosh Hashana. The brick-heavy mahzor (holiday prayer book) has become, over the years, more akin to a never-ending Wikipedia entry, containing every prayer and piyut (Jewish liturgical poem) that was ever written, than a guidebook for spiritual connection. Trying to find the meaningful messages in the morass is possible, but one is just as likely to nod off or go numb as the day stretches on for four or five hours. And then you wake up and do it all over again the next day. What is Michaelson’s prescription for the High Holy Day dilemma? Skip Rosh Hashana entirely and commit to a different day on the Jewish calendar. Michaelson recommends Succot – a holiday of “harvest, joy, environmentalism [and] companionship” that is everything Rosh Hashana isn’t: interactive, kinesthetic and engaging. I’m a big fan of Succot, too. But I’m not ready to dump Rosh Hashana just yet. There are other ways to rehabilitate the day. 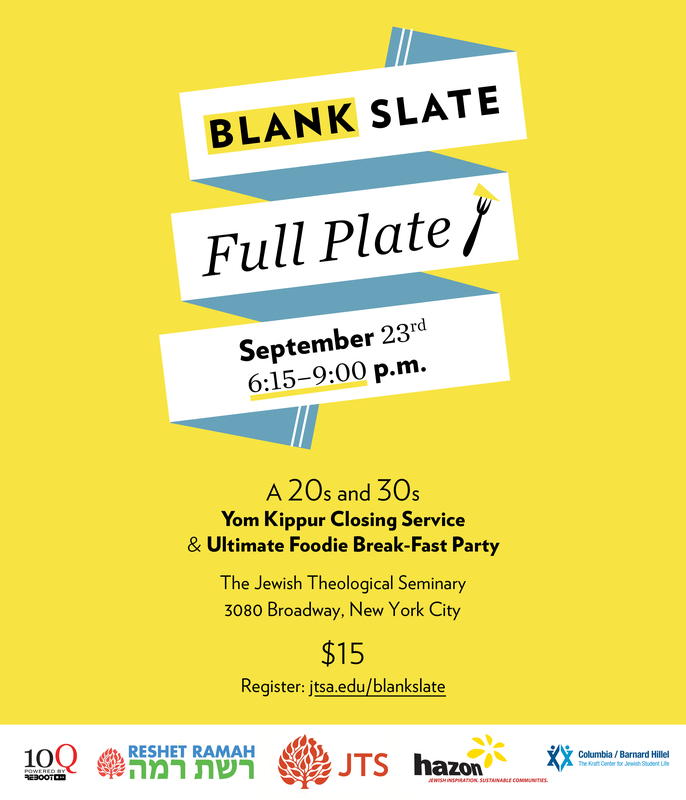 Why not get together with family and friends, whether for a meal or a hike or a game of cards, and use the themes of Rosh Hashana as triggers for deep discussions on repentance or how to build a better, safer and more just society. The Unetaneh Tokef prayer is a good place to start. It sensitizes us to the fragility of life in a world filled with terror. There’s even a bonus prompt to spur discussion on privilege and class. Or combine a debate about Rosh Hashana’s ancient emphasis on “kingship” with a comparison to Game of Thrones. Do all this even if you do go to synagogue. 10Q is a website (doyou10q.com) that presents you with ten questions that you answer online. You then click “Send to Vault” and the site locks your answers away until the following year, when you receive an email inviting you to review what you wrote and to reflect on the year just passed. The questions are meant for private introspection, but they work well in a Rosh Hashana group too. Spend at least some of Rosh Hashana contemplating these questions and you’ll be much closer to the true spirit of the holiday. The author is a freelance writer who specializes in technology, startups and the entrepreneurs behind them. More at www.bluminteractivemedia.com. Original article can be found on The Jerusalem Post here. NYC, it’s time to introduce a little you-time during your daily grind. 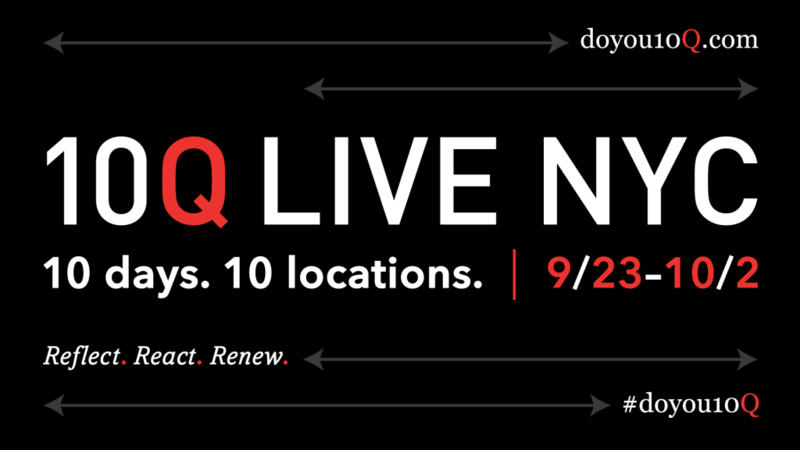 10Q Live is a 10-day interactive installation designed to place self-reflection and peace of mind at the forefront of your daily routine. Inspired by 10Q, an initiative created to help introduce reflection in a 10-day period, 10Q Live offers you a chance to look back on the past year and year ahead in real time. Engage, interact, and experience a moment of introspection away from your daily grind. Housed within a pop-up exhibit that changes locations around the city daily, this experience is both personal and shared, as it lives and breathes with the rhythm of New York City. 10Q Live embraces and welcomes people of all ages and backgrounds. Locations will be released days leading up to each event so stay tuned! Visit www.doyou10Q.com for more details. Reset your system with our modern spin on a 600-year-old Rosh Hashanah ritual called tashlich. This custom of ridding ourselves of all our bad vuggum (karma) from the previous year and getting a fresh start for the new one is traditionally enacted by tossing bread into the ocean. Join us by the shore at Ocean Beach (near Fulton) for a brief, engaging ritual and joyful noise accompaniment from shofar blowers, bag pipers, members of the Jazz Mafia and the Ministers of Sound of the Saint John Will-I-Am Coltrane African Orthodox Church. Bring stale bread to share and a shofar, if you have one, to blow along with some of San Francisco’s finest players. Enjoy our twist on the traditional sweet with s’mores roasted over a bonfire. Tashlique presented by the JCCSF and Reboot with community partners Big Tent Judaism Concierge for Solo Moms, Birthright of the Jewish Federation, The Brandeis School of San Francisco, Congregation Beth Sholom, Congregation B’nai Emunah, InterfaithFamily Bay Area, JIMENA, Keshet, The Kitchen, Moishe House San Francisco, the Young Adult Division (YAD) of the Jewish Federation, and the Yeashore Community. With deep appreciation to the Koret Foundation, the Jim Joseph Foundation, the Bernard Osher Jewish Philanthropies Foundation of the Jewish Community Federation and Endowment Fund and the Alexander M. and June L. Maisin Foundation of the Jewish Community Federation and Endowment Fund for supporting Reboot programs throughout the year. Write your reflections on the 10Q Graffiti Wall. Stop by for a taste of honey and participate in tashlikh, an opportunity to reflect and then release personal regrets from the past year. Write your reflections on the Reboot 10Q Graffiti Wall. This drop-in event includes New Year card decorating, for spreading well wishes around the community, and candle-making so you can incorporate a handmade item into your High Holiday traditions. At 3 p.m., in honor of the coming Shabbat, we will gather in the JCCSF’s Atrium to sing and offer gratitude, share stories and schmooze over grape juice and challah. Discover more events near you here! Reset your system with our modern spin on a 600-year-old Rosh Hashanah ritual called tashlih. This custom of ridding ourselves of all our bad vuggum (karma) from the previous year and getting a fresh start for the new one is traditionally enacted by tossing bread into the ocean. Join us by the shore at Ocean Beach (near Fulton) for a brief, engaging ritual and joyful noise accompaniment from shofar* blowers, bag pipers, members of Jazz Mafia and the Ministers of Sound of the Saint John Will-I-Am Coltrane African Orthodox Church. Bring stale bread to share and a shofar, if you have one, to blow along with some of San Francisco’s finest players. Enjoy our twist on the traditional sweet with s’mores and Rocky’s Fry Bread.Presented by the JCCSF, Reboot and the Jewish Community Federation of San Francisco with community partners Big Tent Judaism Concierge for Solo Moms, Birthright of the Jewish Federation, The Brandeis School of San Francisco, Interfaith Family, JIMENA, Keshet, The Kitchen, Moishe House San Francisco and the Young Adult Division (YAD) of the Jewish Federation. Get bad before you get good. The party for the afterwork crowd celebrates the Days of Awe and Amy Winehouse with soul music, tattoos, cocktails, fashion, big hair, drag, and more. Boogie down with Bay Area native musician Bart Davenport, make Amy inspired crafts, adorn yourself in ode to Amy at The Balm Liner & Lip Bar, and browse some vinyl from the Explorist International pop-up shop. Enjoy Amy’s favorite West Indian cuisine from Peaches Patties at their La Cocina pop-up. Sip specialty cocktails by Tonic while groovin’ to the tracks of Phengren Oswald of the Saturday Night Soul Party. For more info and to get your tickets click here. The CJM’s Night at the Jewseum is funded by the Young Funders Impact Grants Initiative of the Jewish Community Federation and Endowment Fund. 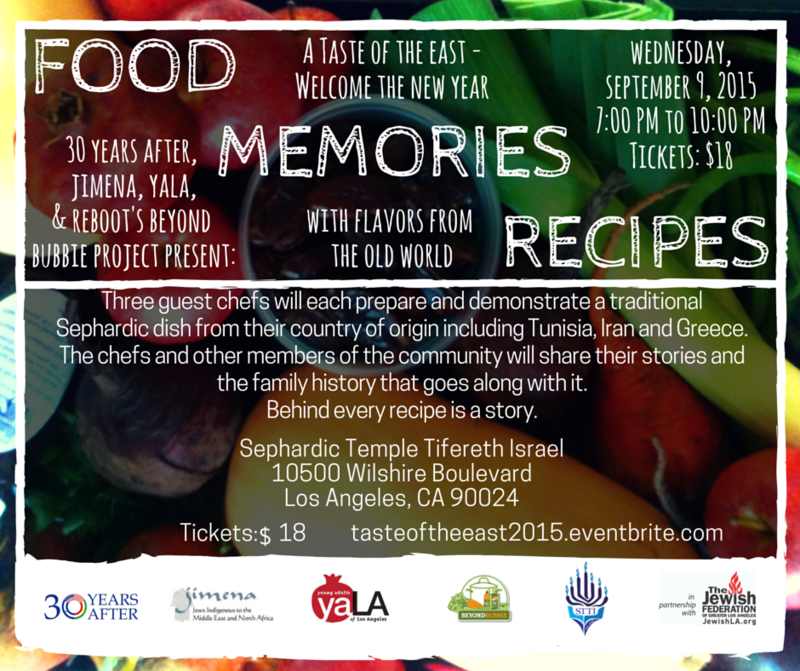 Join Reboot, Wilshire Blvd Temple and the Women’s Center for Creative Work for a new approach to Sukkot. We will gather to help build the Sukkah, enjoy a meal in the natural environment of Coldwater Canyon Park, and dismantle the Sukkah together as we explore the notions of fragility and groundedness.